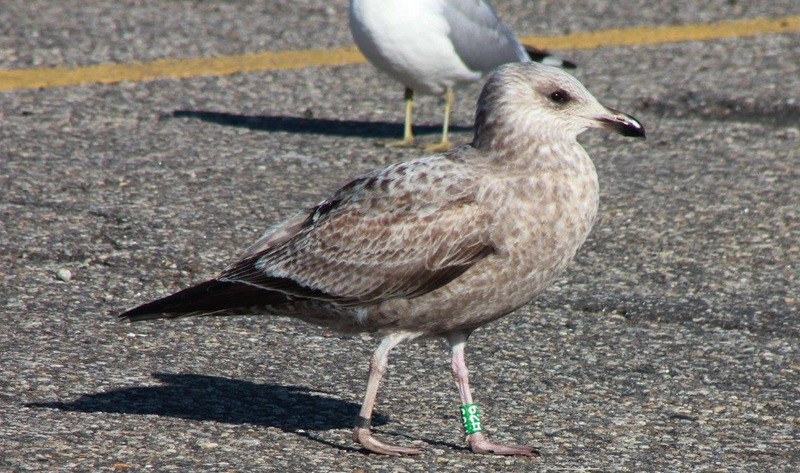 American Herring Gull (smithsonianus) 62H 1st - 3rd cycle (1CY-4CY), September 2015 - March 2018, Stratford, CT. Picture: Donna Caporaso & Patrick Comins. 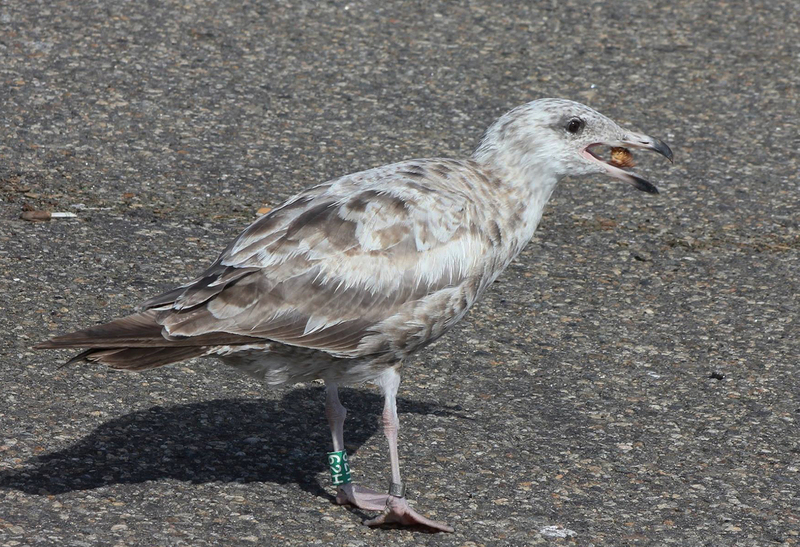 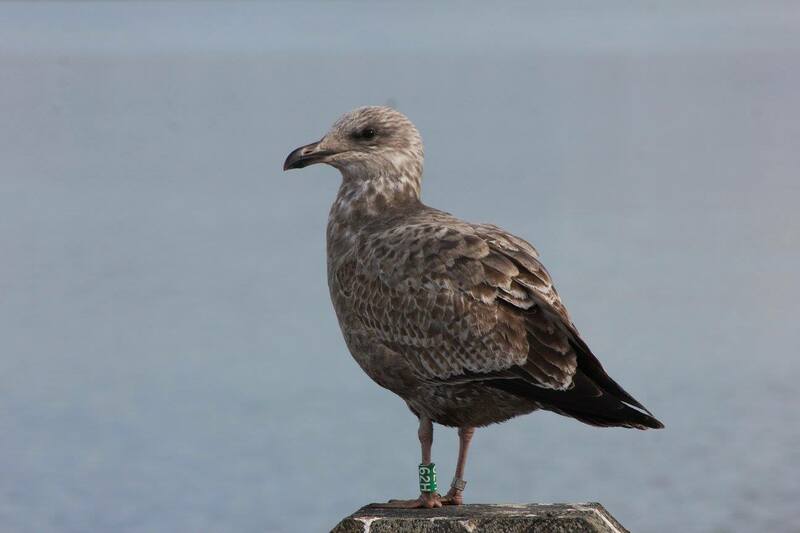 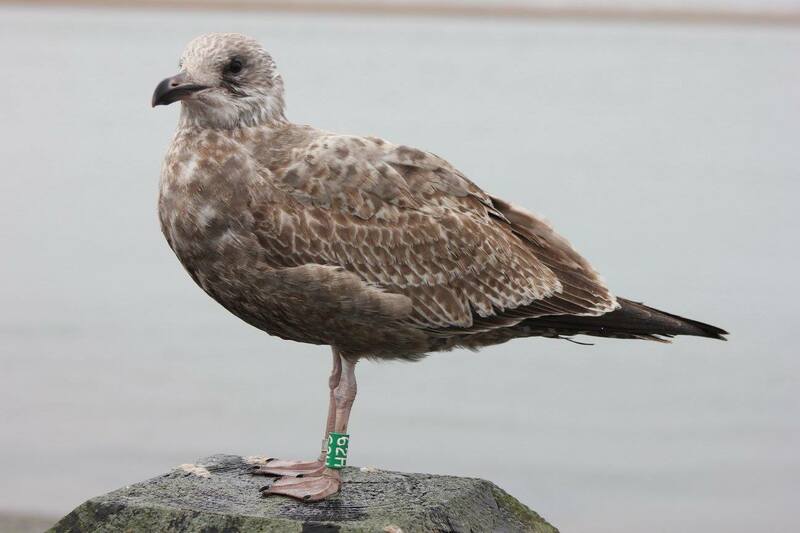 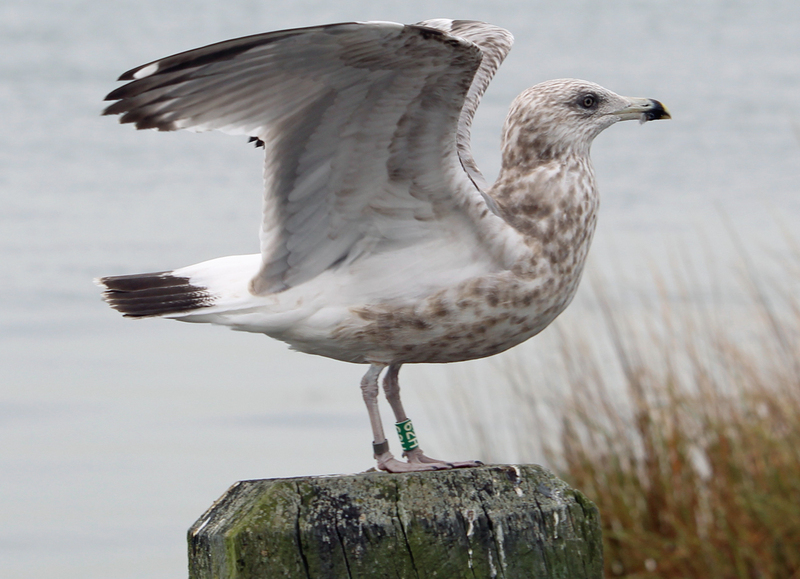 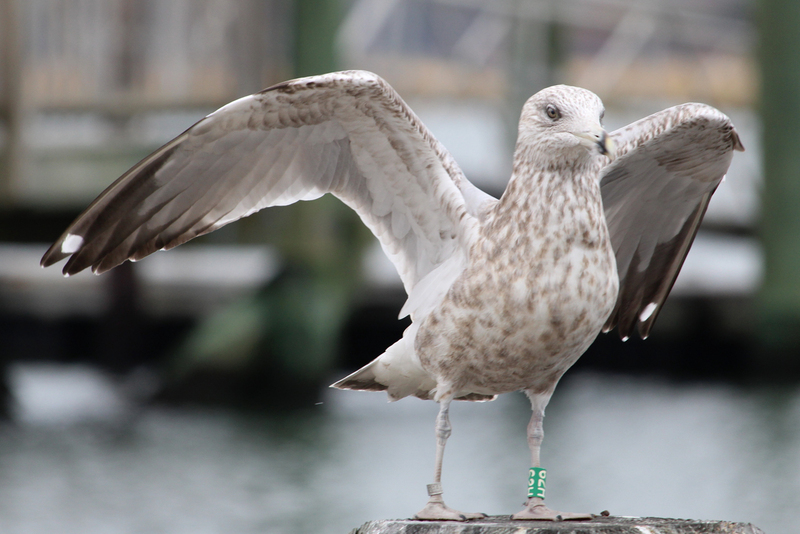 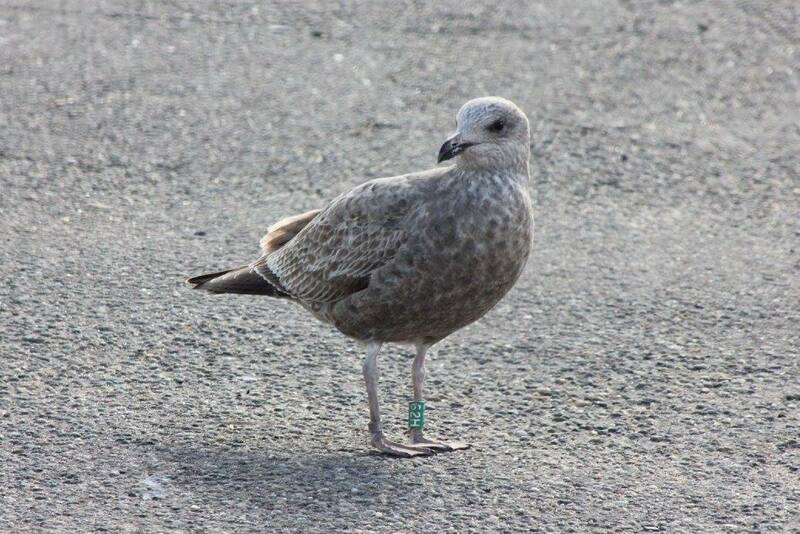 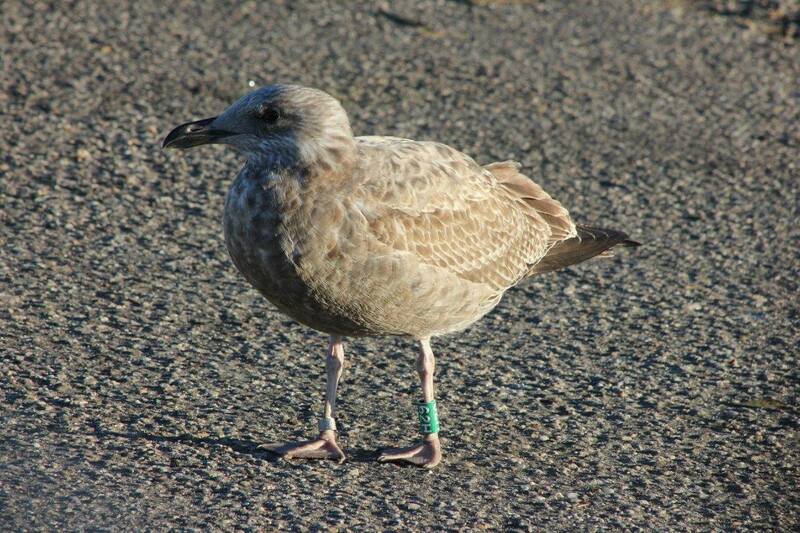 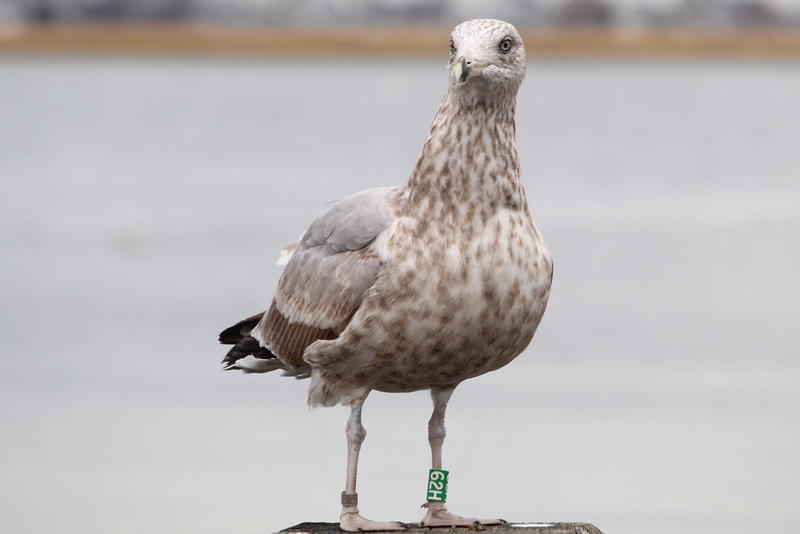 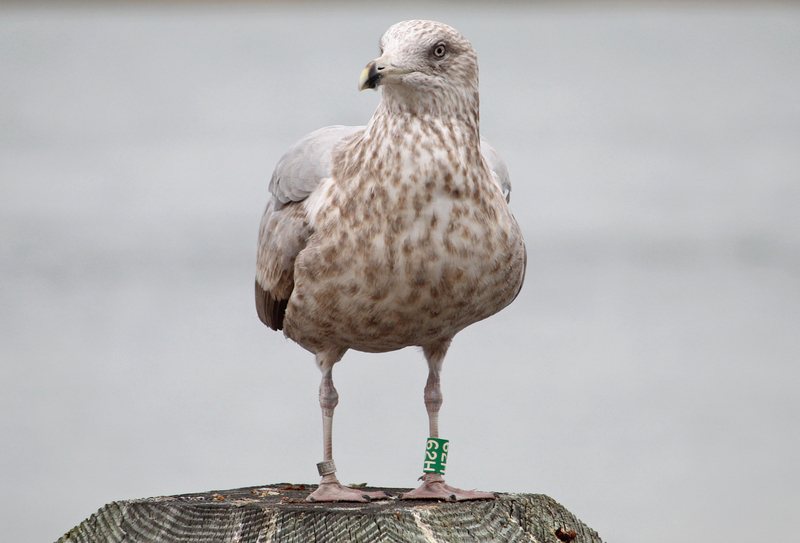 Green 62H and metal USGS band 2007-08143, banded as pullus on July 17 2015 at Appledore Island, Maine. 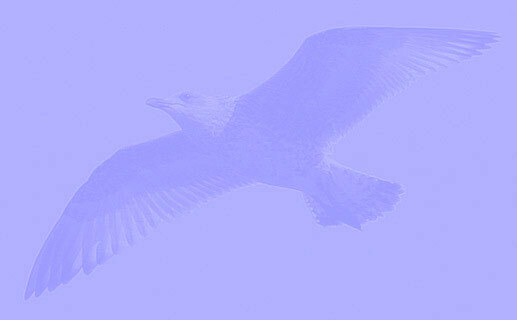 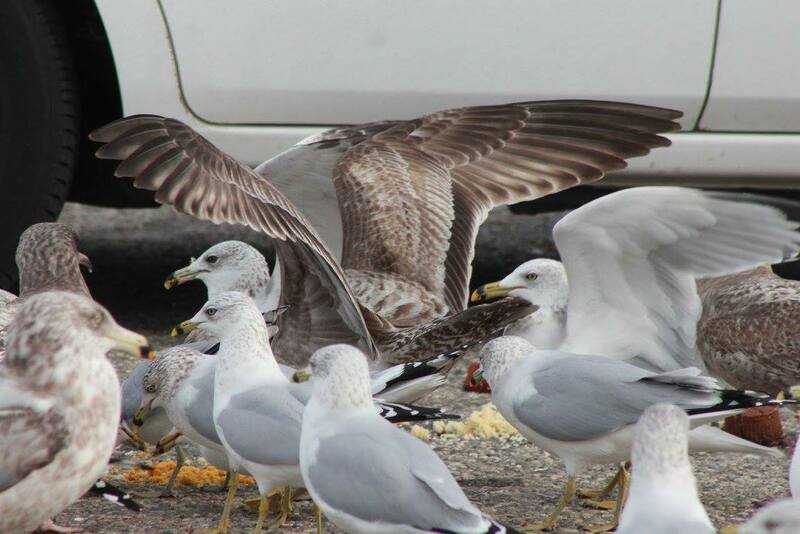 See website: The Gulls Of Appledore. 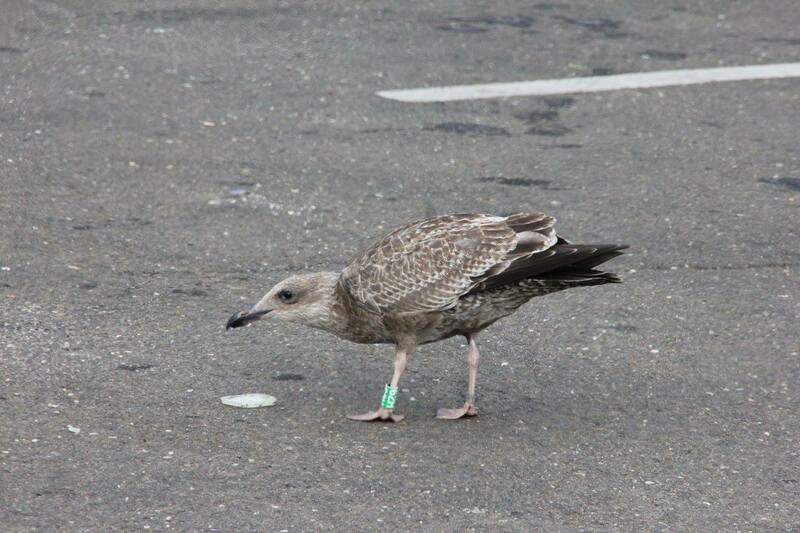 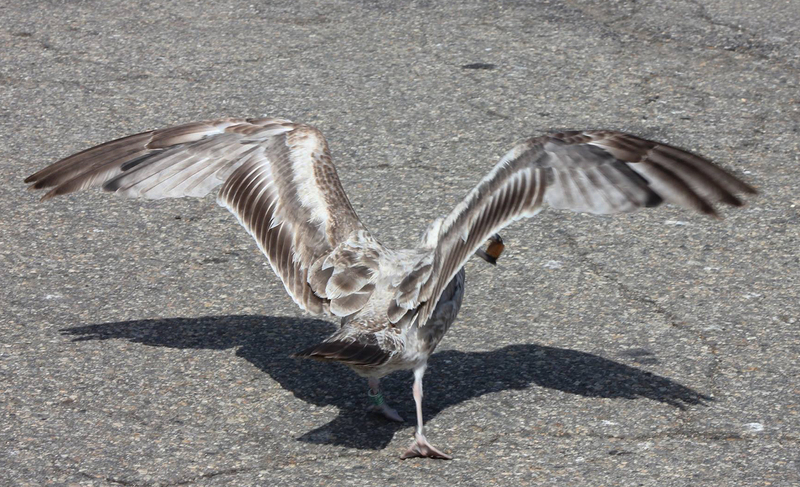 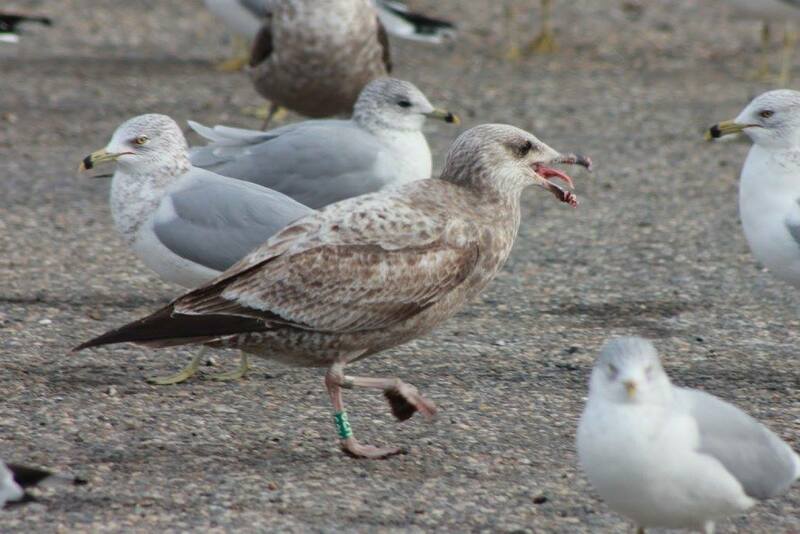 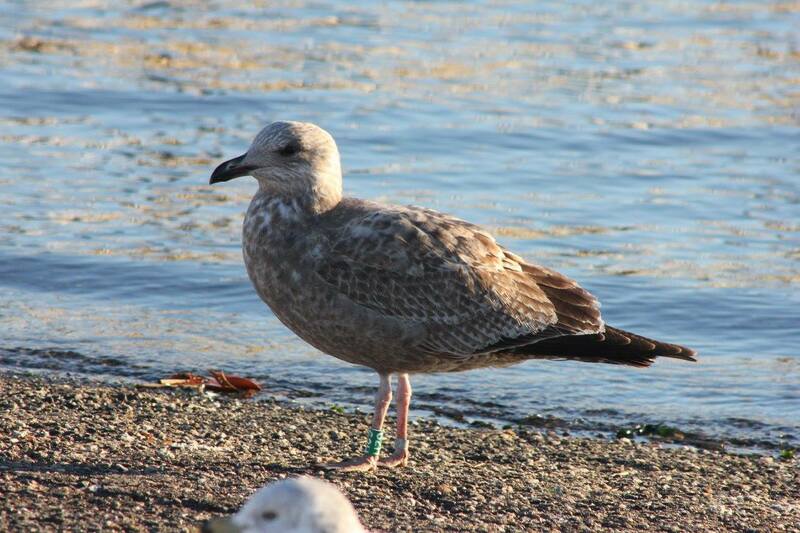 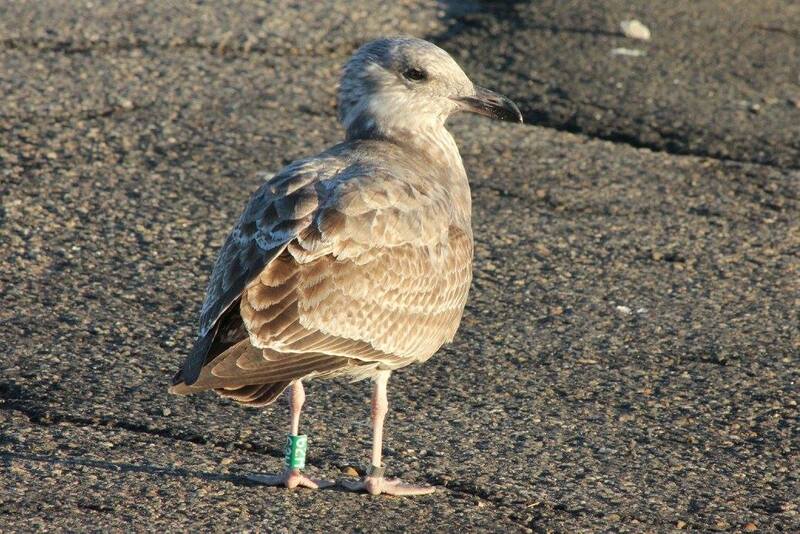 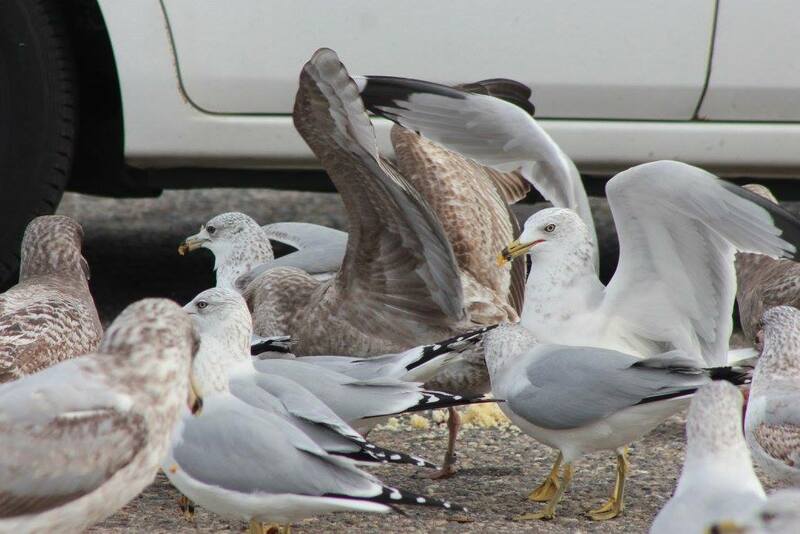 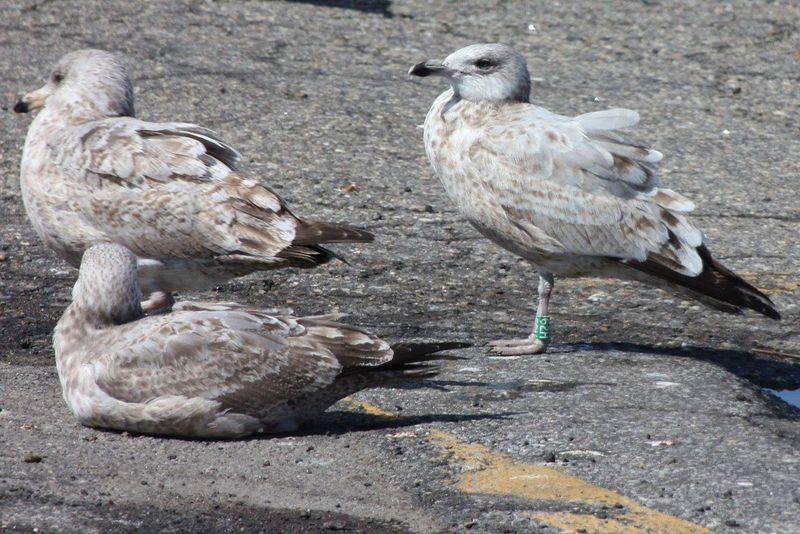 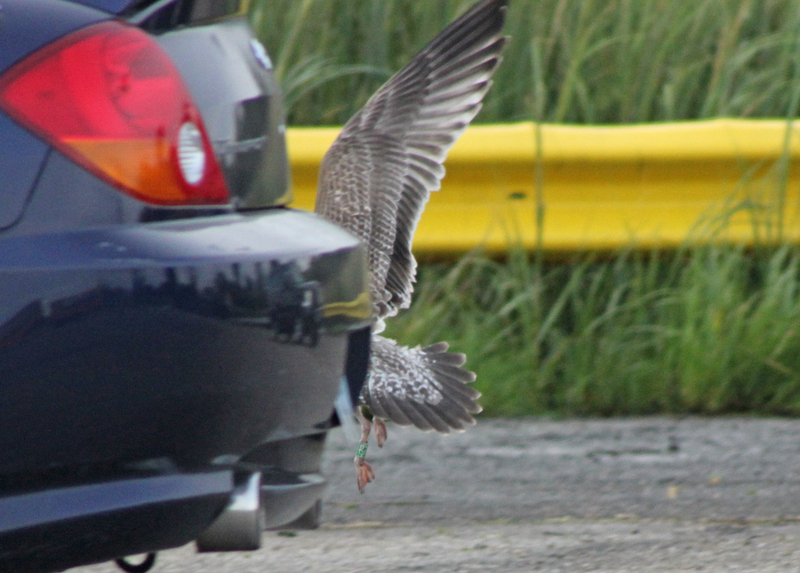 below: American Herring Gull (smithsonianus) 62H 1st cycle (1CY), September 22 2015, Birdseye Boat Ramp - Stratford, CT. Picture: Donna Caporaso. 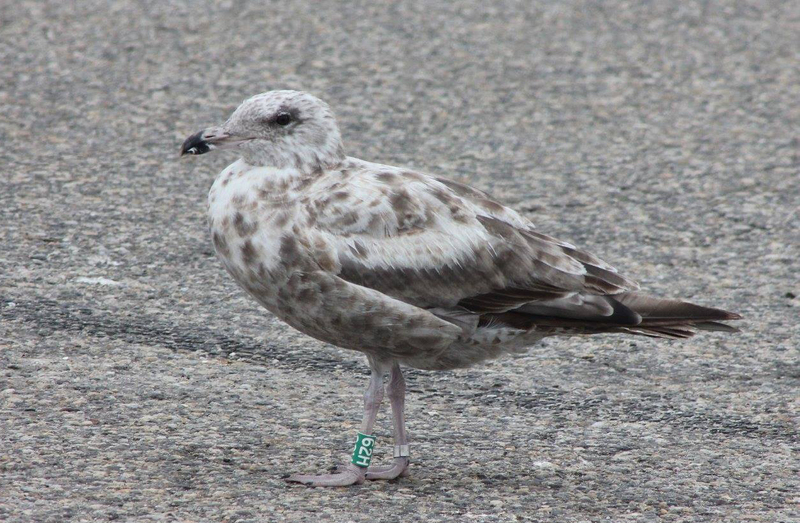 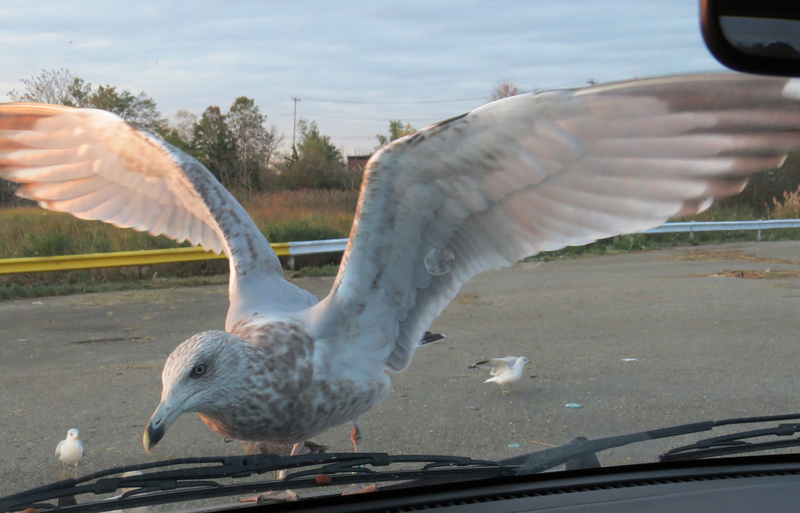 below: American Herring Gull (smithsonianus) 62H 1st cycle (1CY), September 28 2015, Birdseye Boat Ramp - Stratford, CT. Picture: Donna Caporaso. 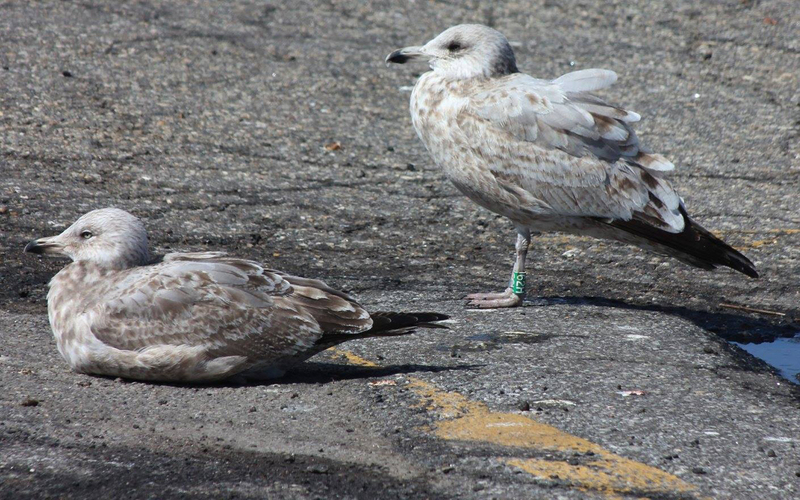 below: American Herring Gull (smithsonianus) 62H 1st cycle (1CY), October 17 & 20 2015, Stratford, CT. Picture: Donna Caporaso & Patrick Comins. 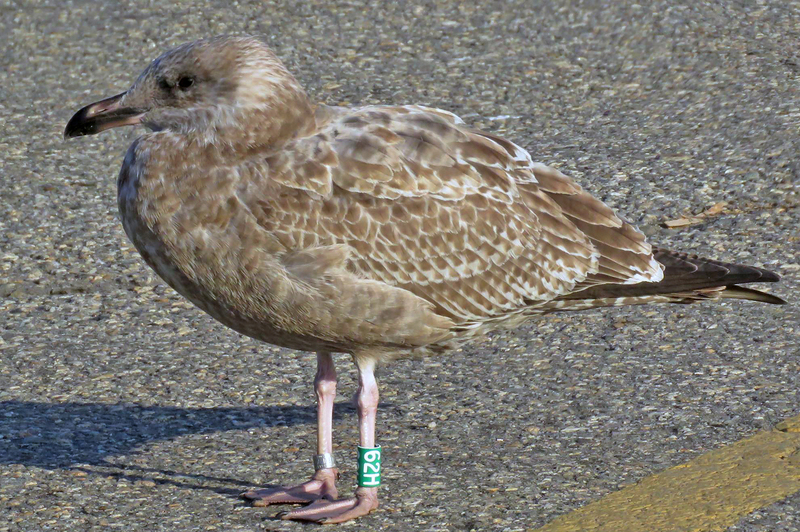 Juvenile plumage with small upper scaps replaced for 2nd gen. 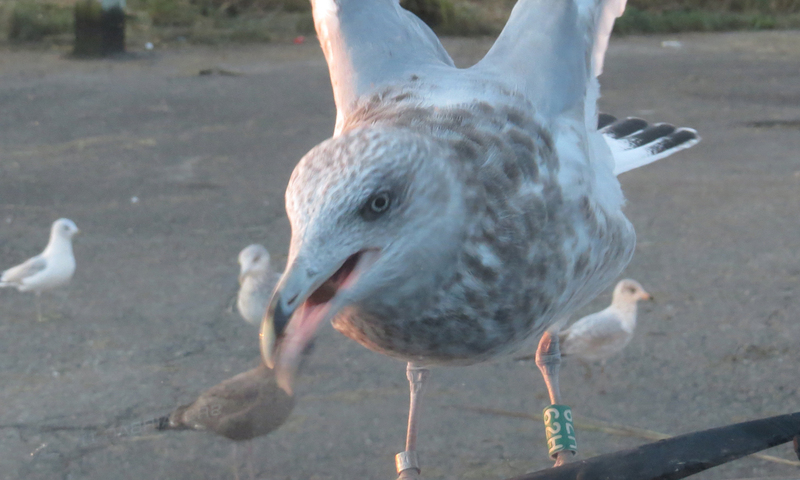 Pink on base of lower mandible starting to develop. 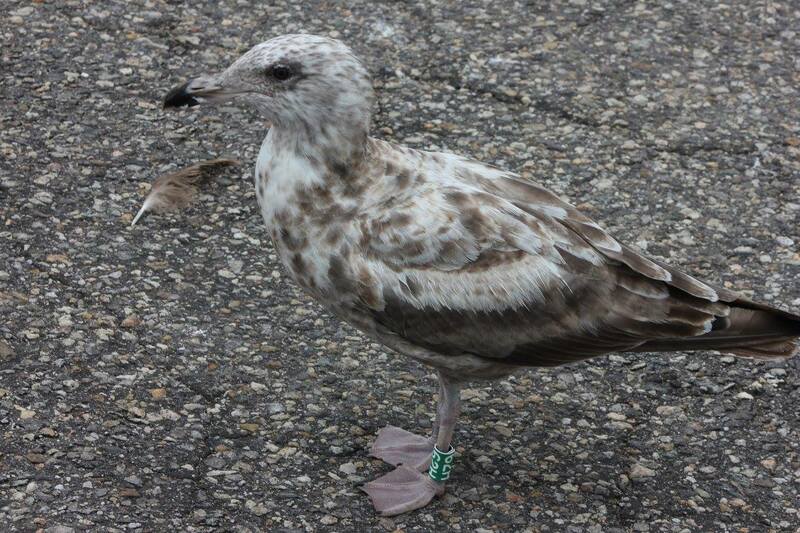 below: American Herring Gull (smithsonianus) 62H 1st cycle (1CY), November 11 2015, Stratford, CT. Picture: Donna Caporaso. 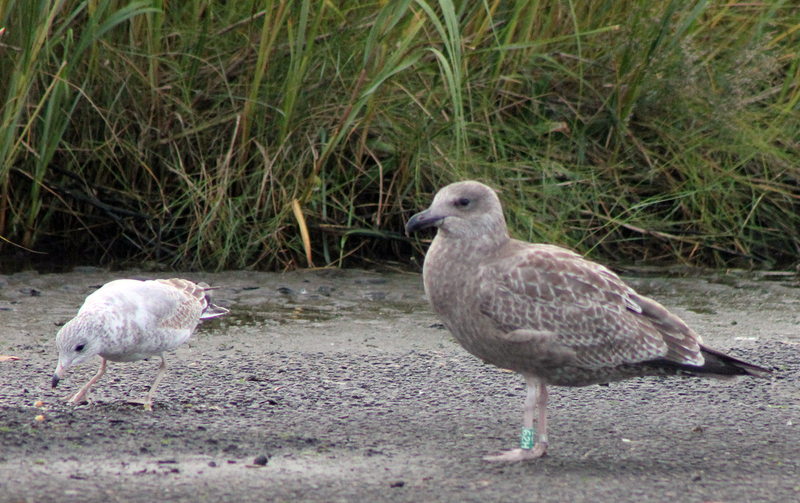 Obvious moult going on in scap region. 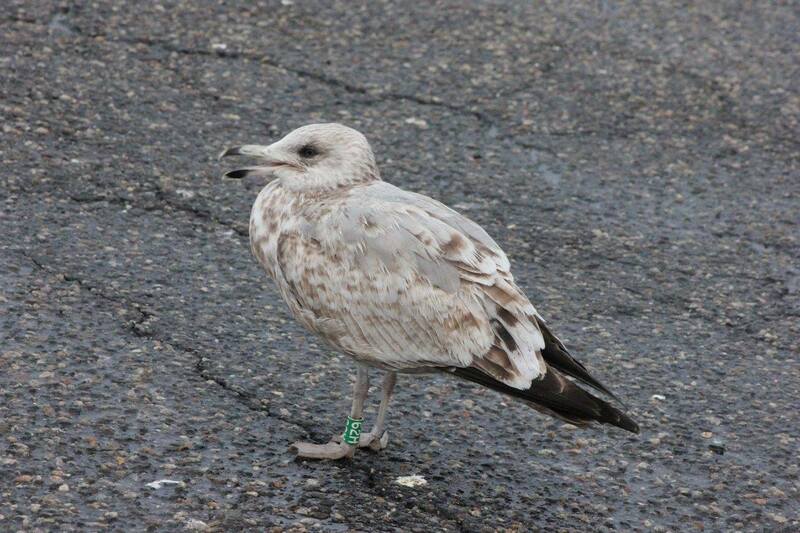 below: American Herring Gull (smithsonianus) 62H 1st cycle (1CY), November 13 2015, Stratford, CT. Picture: Donna Caporaso. 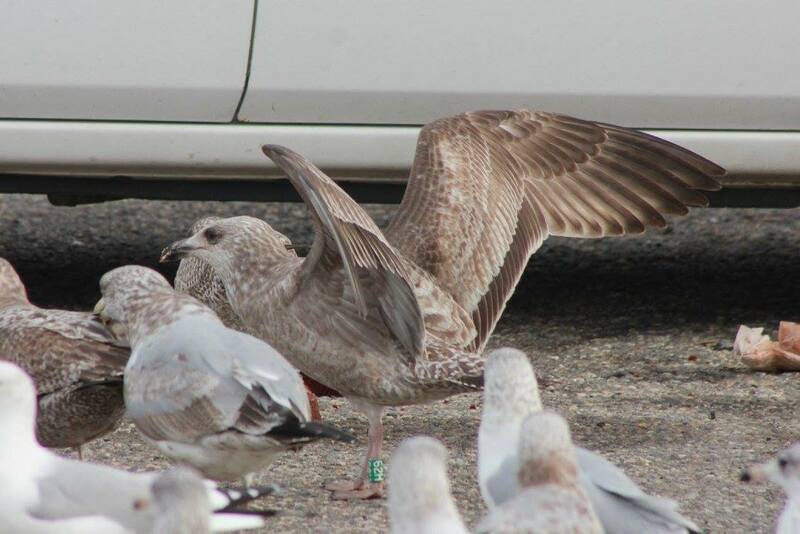 below: American Herring Gull (smithsonianus) 62H 1st cycle (1CY), November 15 2015, Stratford, CT. Picture: Donna Caporaso. 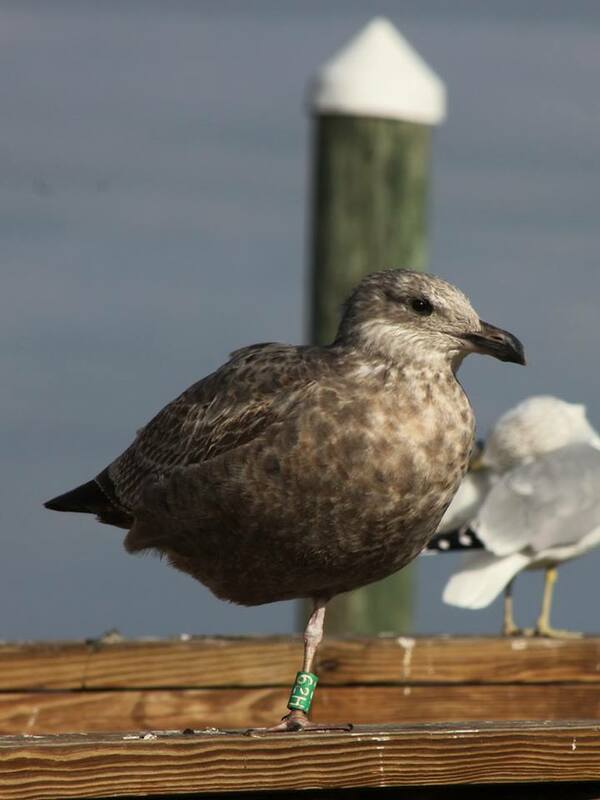 below: American Herring Gull (smithsonianus) 62H 1st cycle (1CY), November 17 2015, Stratford, CT. Picture: Donna Caporaso. 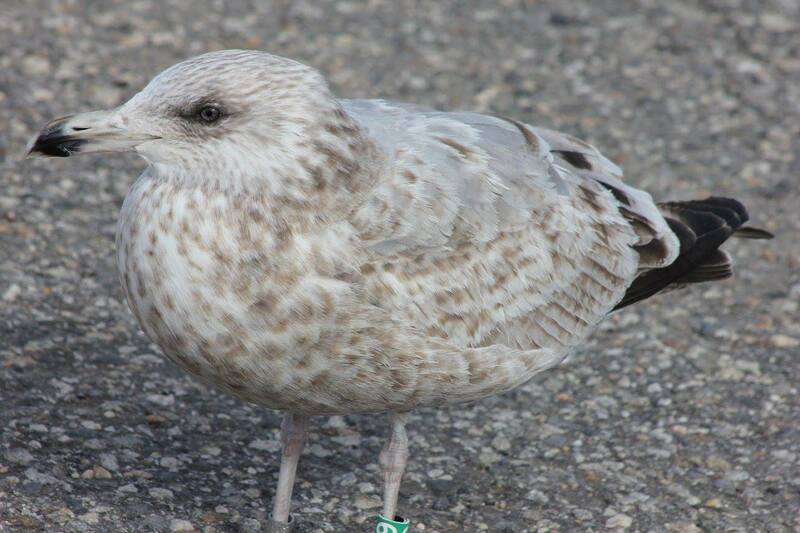 below: American Herring Gull (smithsonianus) 62H 1st cycle (1CY), November 23 2015, Stratford, CT. Picture: Donna Caporaso. 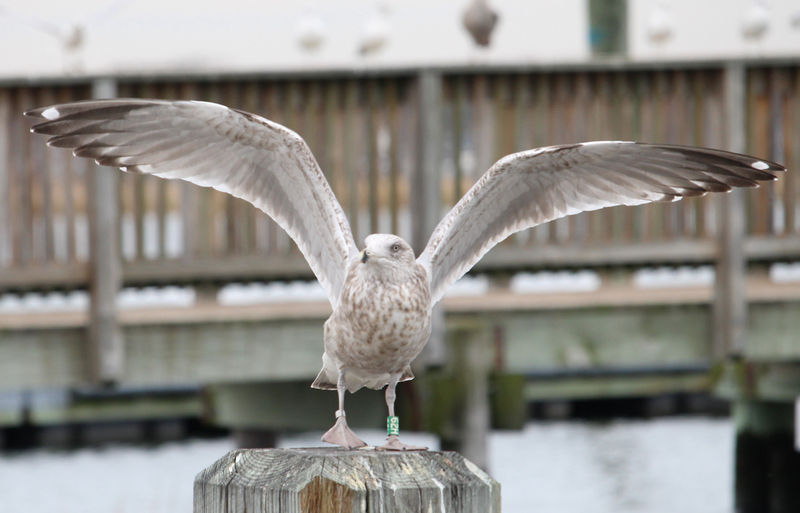 below: American Herring Gull (smithsonianus) 62H 1st cycle (1CY), November 26 2015, Stratford, CT. Picture: Donna Caporaso. 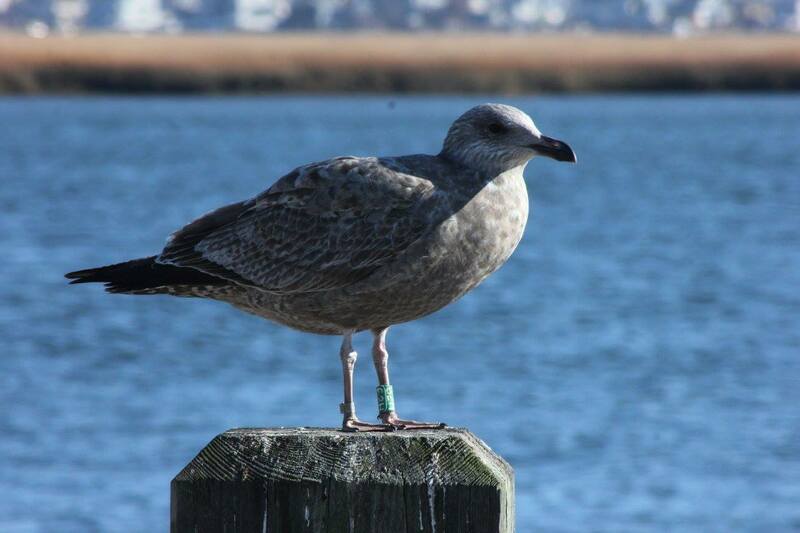 below: American Herring Gull (smithsonianus) 62H 1st cycle (1CY), November 30 2015, Stratford, CT. Picture: Donna Caporaso. 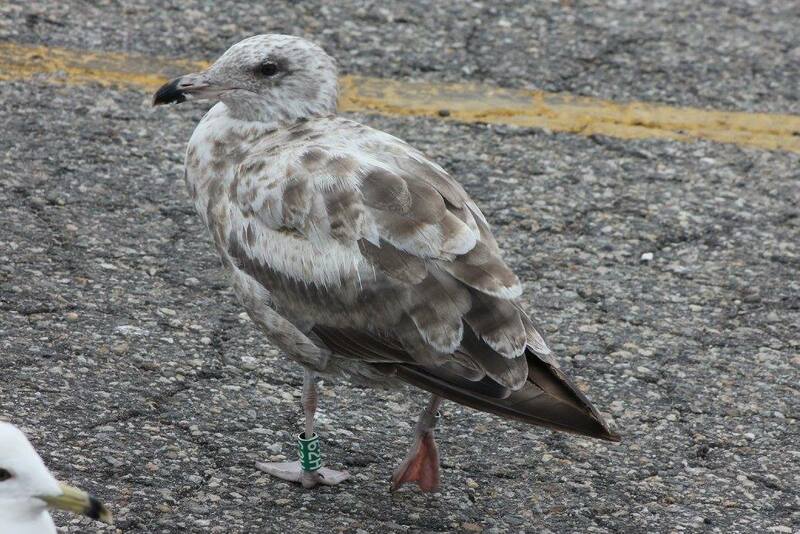 below: American Herring Gull (smithsonianus) 62H 1st cycle (1CY), December 06 2015, Stratford, CT. Picture: Donna Caporaso. 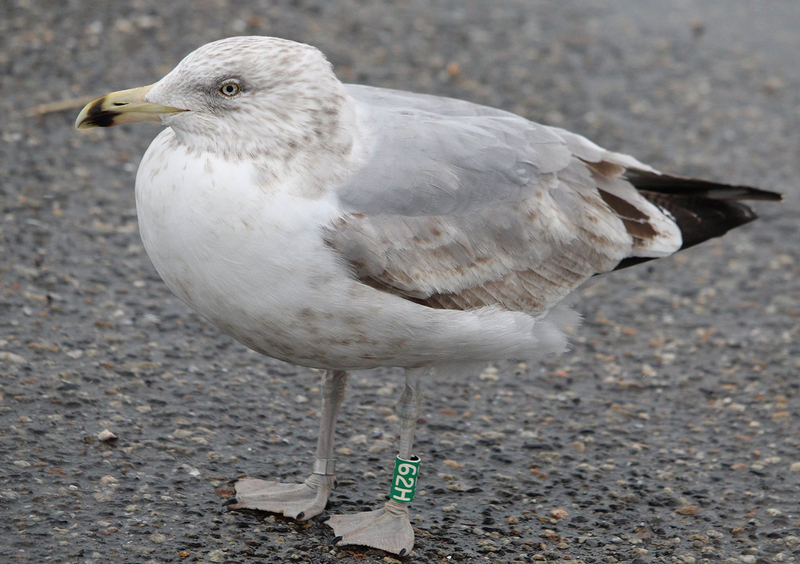 below: American Herring Gull (smithsonianus) 62H 1st cycle (1CY), December 08 2015, Stratford, CT. Picture: Donna Caporaso. 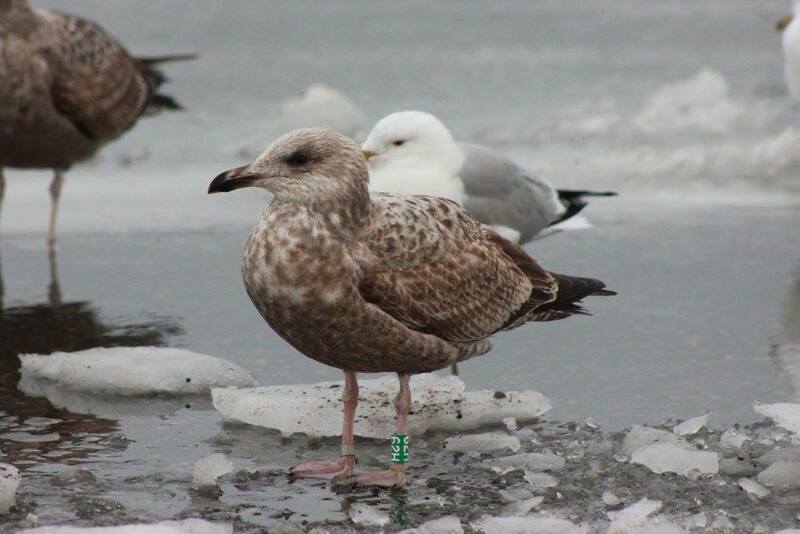 below: American Herring Gull (smithsonianus) 62H 1st cycle (2CY), February 16 2016, Stratford, CT. Picture: Donna Caporaso. 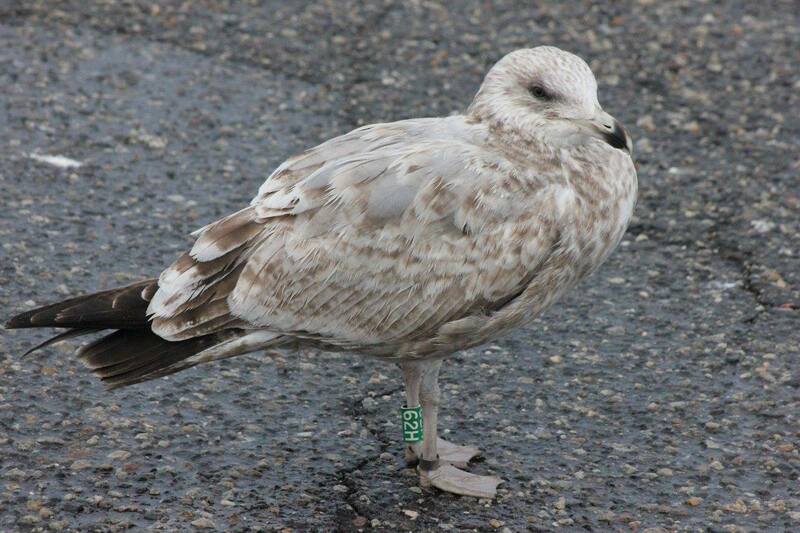 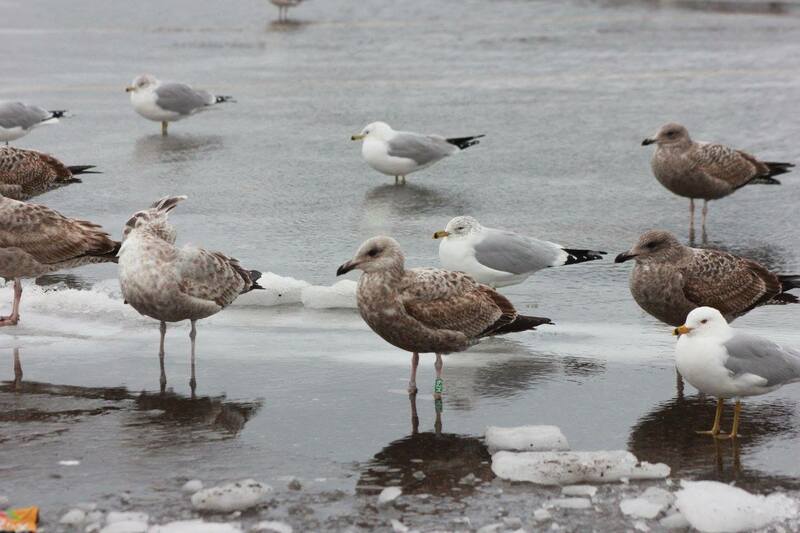 below: American Herring Gull (smithsonianus) 62H 1st cycle (2CY), February 20 2016, Stratford, CT. Picture: Donna Caporaso. 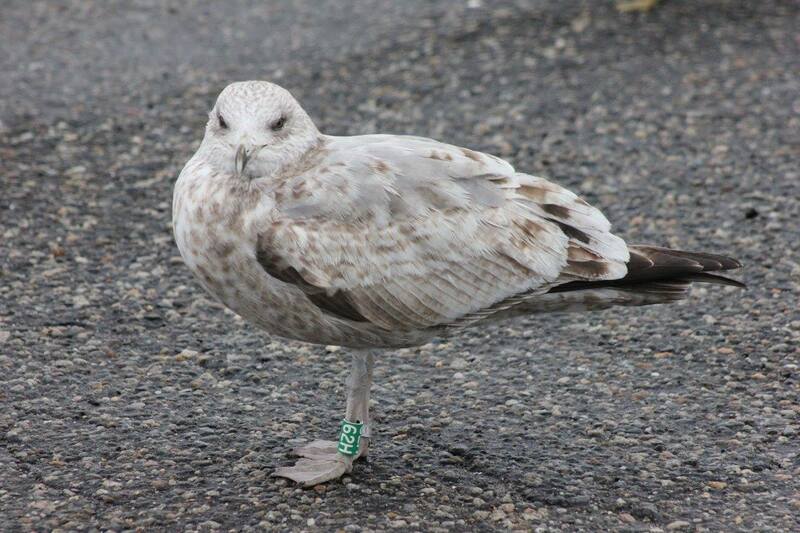 below: American Herring Gull (smithsonianus) 62H 1st cycle (2CY), February 21 2016, Stratford, CT. Picture: Donna Caporaso. 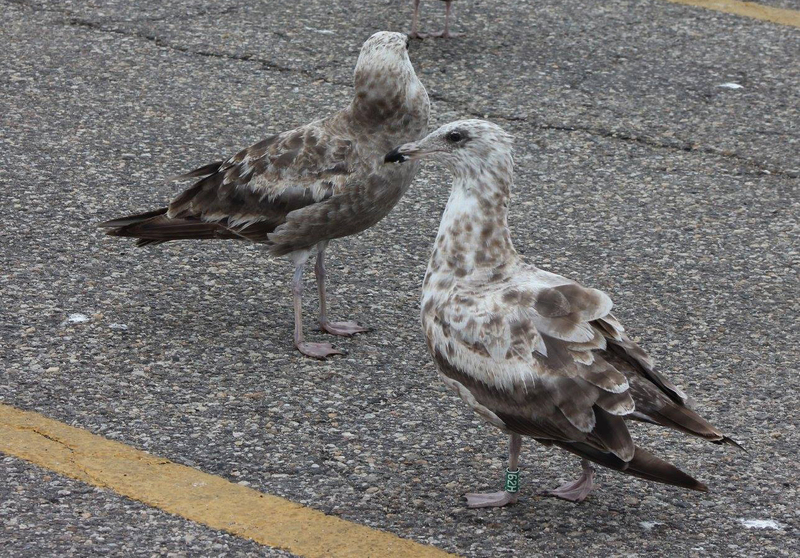 below: American Herring Gull (smithsonianus) 62H pre-basic moult (2CY), July 03 2016, Stratford, CT. Picture: Donna Caporaso. 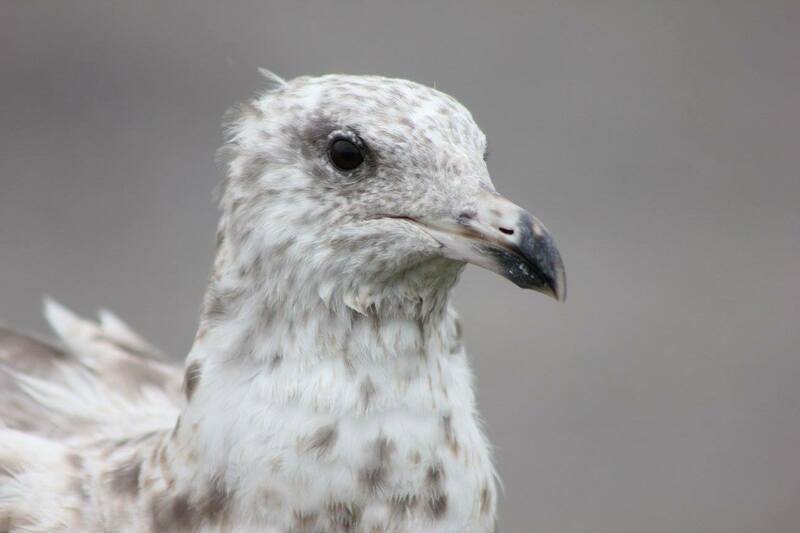 In complete moult: P1-P5 fully grown, P6 halfway, P7 missing, P8-P10 old juvenile. 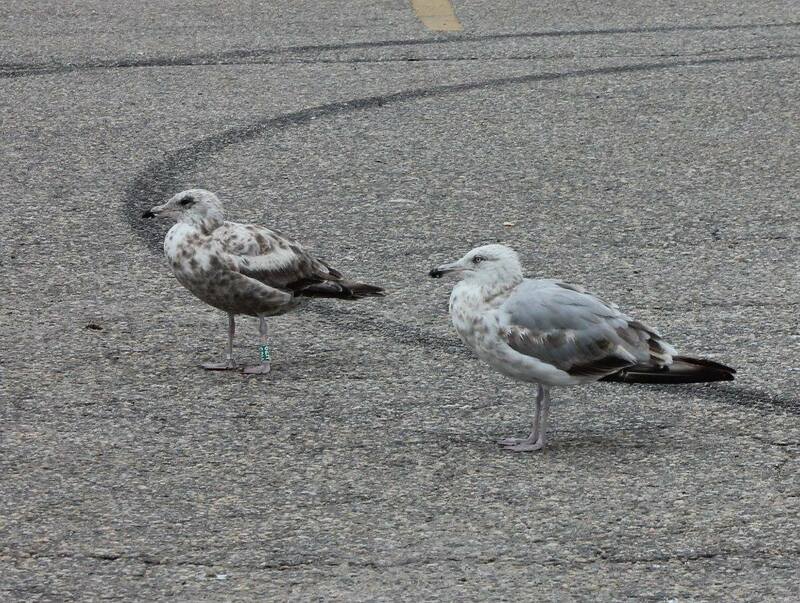 Secondaries: S1 growing, probably S2 missing. 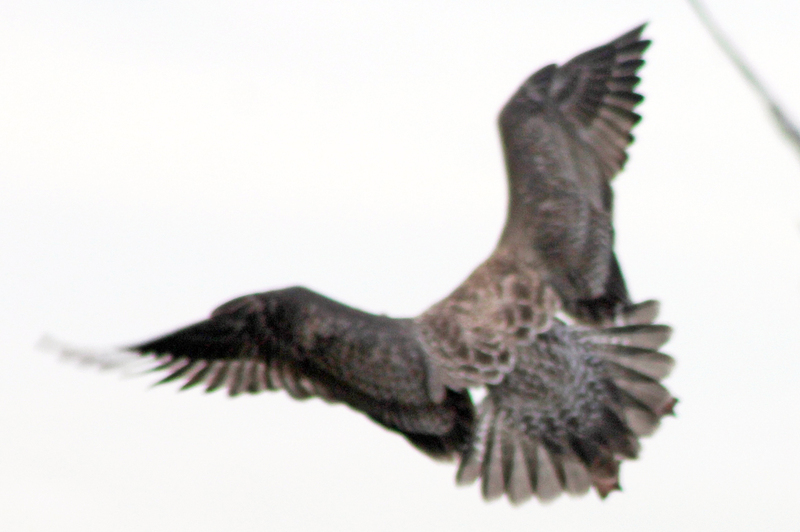 Moult in secondaries starts slowly, but within two weeks the old juvenile feathers will almost be dropped simultaneously, increasing the moult gap in this feather tract. 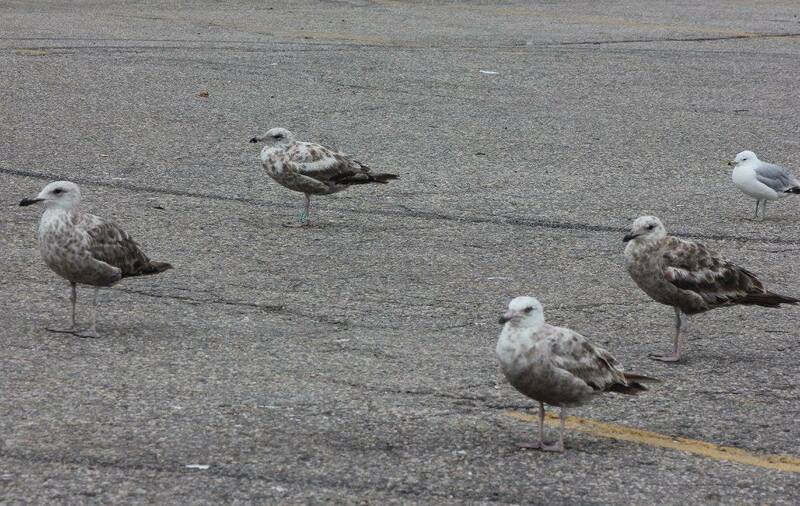 Rectrices: apparently no tail-feathers missing yet, probably will start this very week. 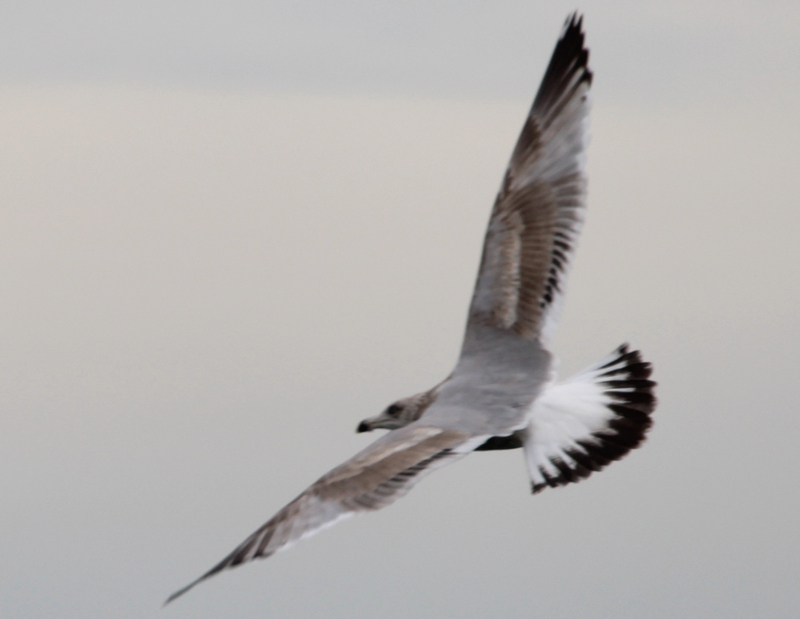 Already starting to replace uppertail coverts. 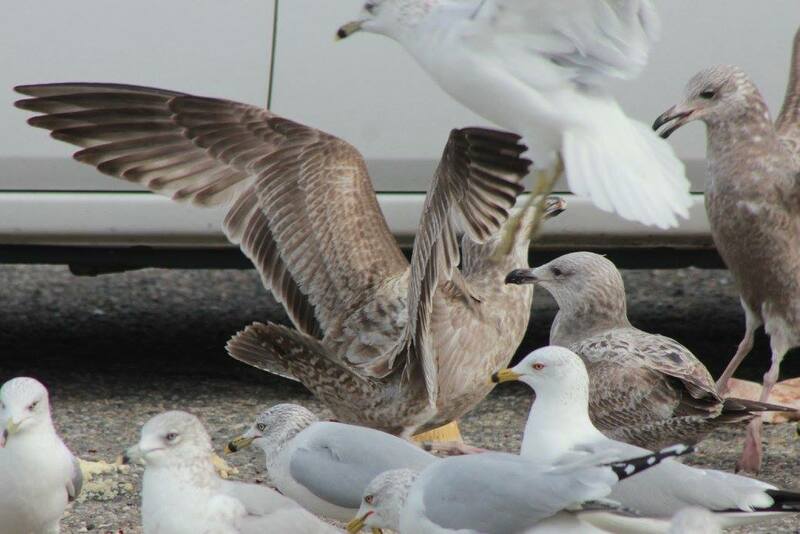 New 2nd generation feathers in the wing-coverts are very obviously different from the worn and bleached old juvenile wing-coverts. 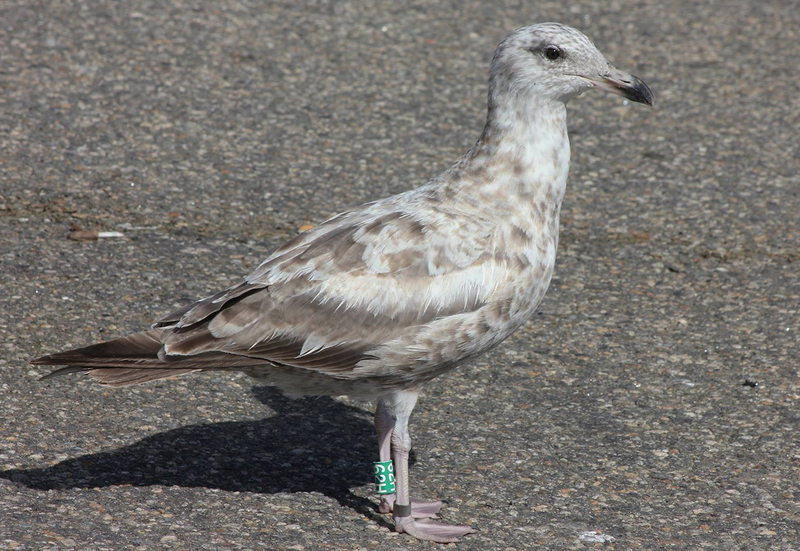 This bird follows the 'ordinary sequence' with upper tertials replaced, complete median covert row new and some inner greater coverts replaced. 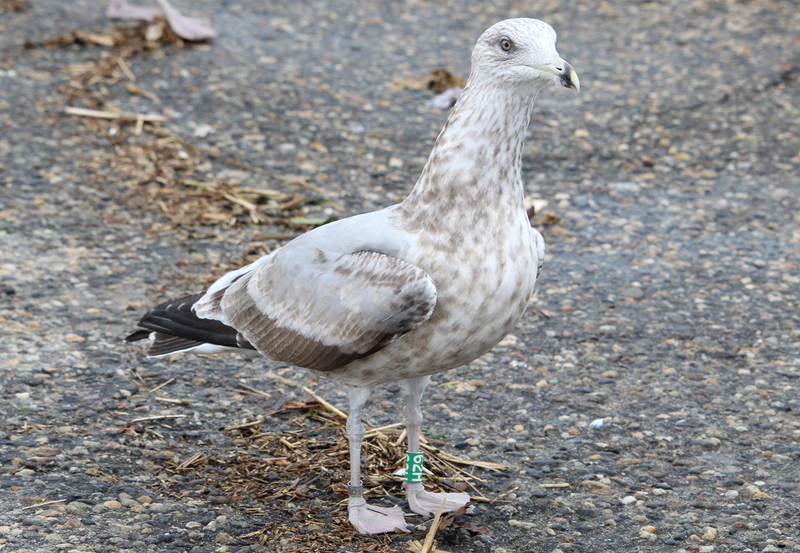 In the greater coverts two moult waves (from outermost location and from innermost location) will result in central feathers replaced last in line (still old juvenile central GC present). 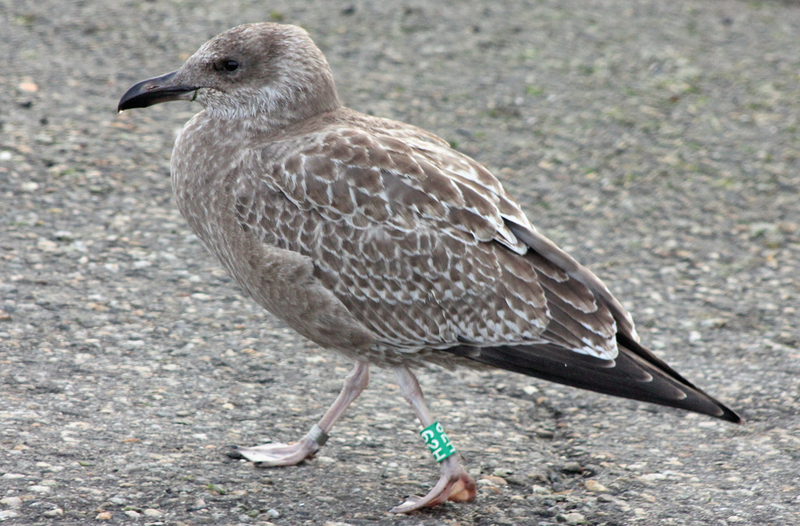 Lesser coverts area largely juvenile. 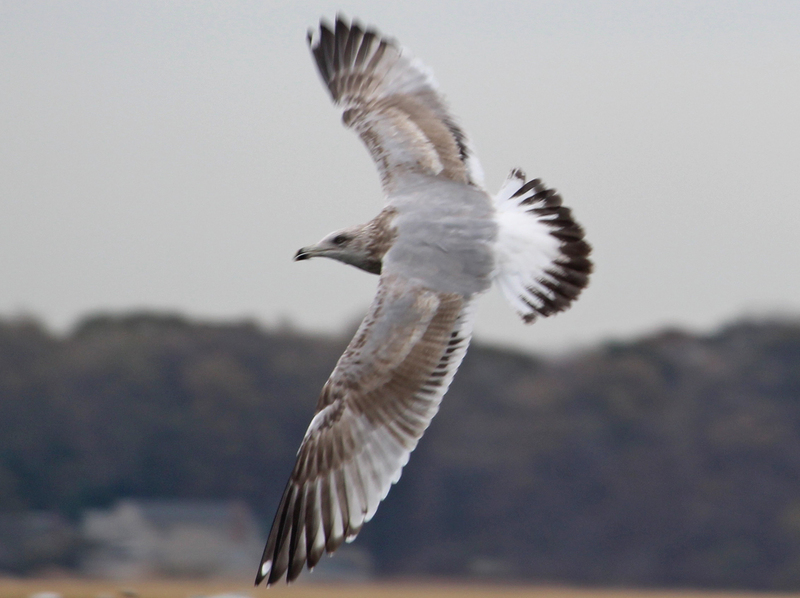 This bird nicely demonstrates that moult in scaps continues (new feathers with dark centres) but at low pace in this region: only few new feathers present. 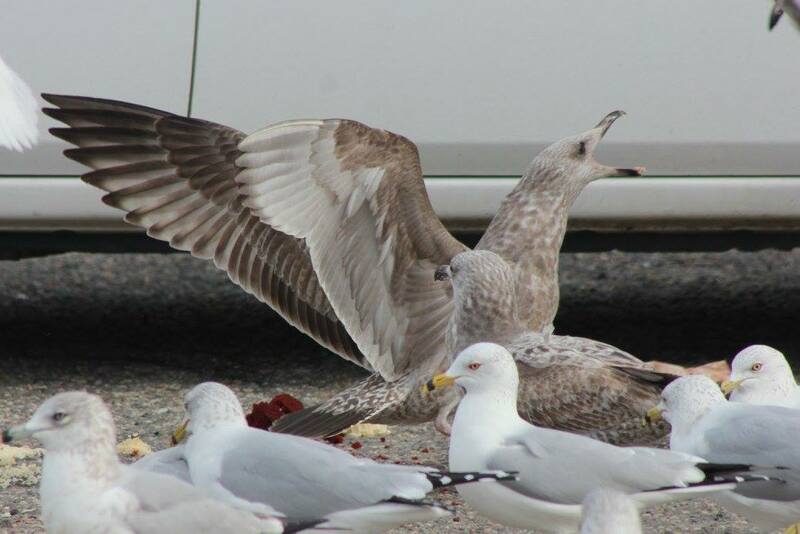 Most energy consuming moult prcess now obviously in the large primary feathers and wing-coverts. 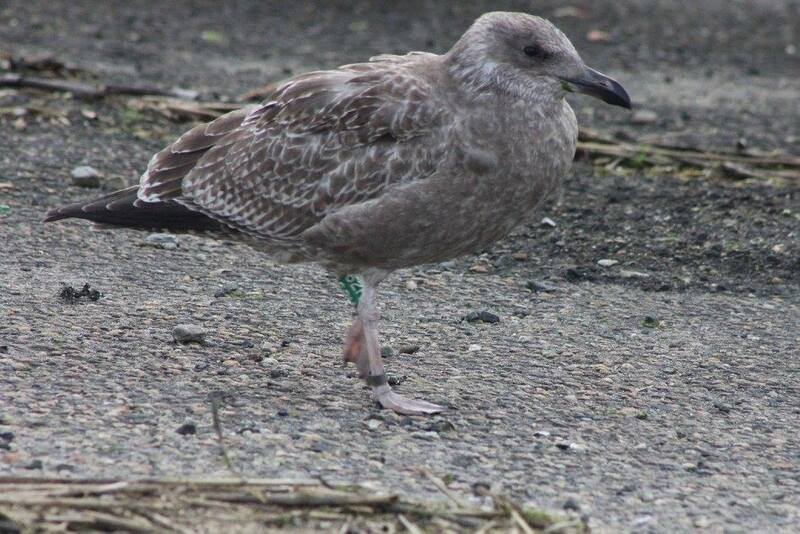 Bare parts much immature with dark iris and broad dark tip on pinkish bill. 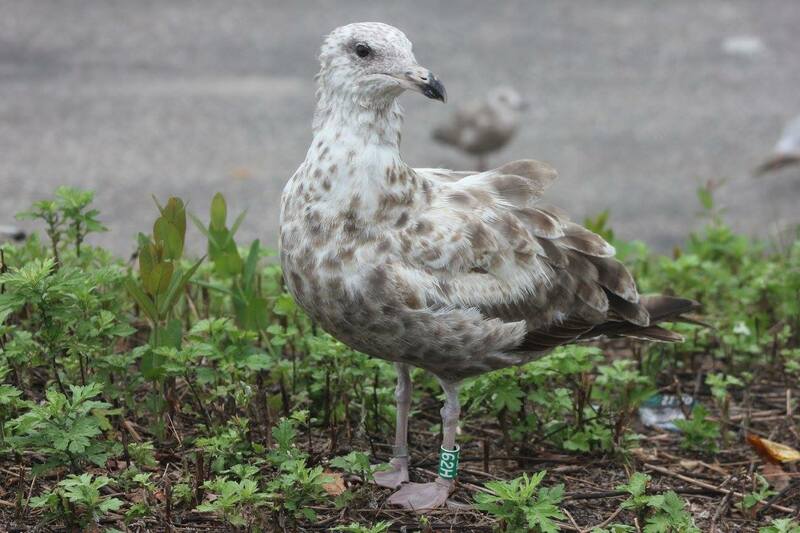 below: American Herring Gull (smithsonianus) 62H pre-basic moult (2CY), July 10 2016, Stratford, CT. Picture: Donna Caporaso. 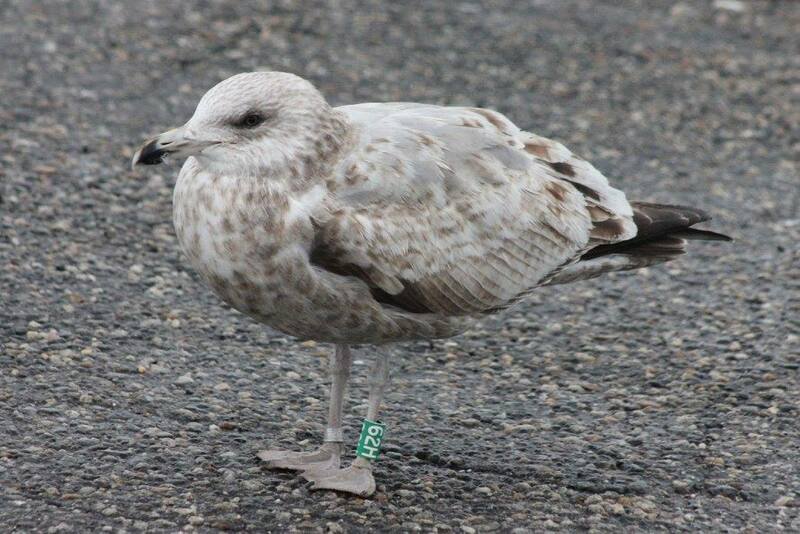 below: American Herring Gull (smithsonianus) 62H 2nd cycle (3CY), March 8-17 2017, Stratford, CT. Picture: Donna Caporaso. 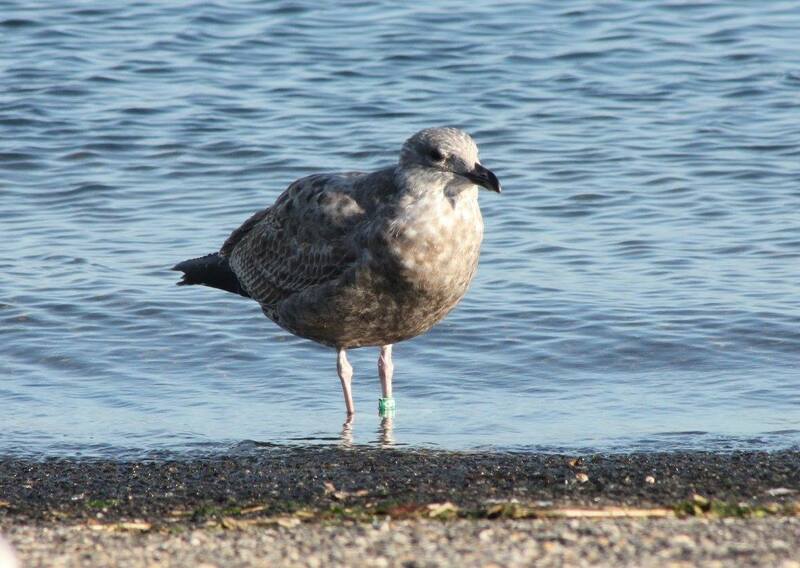 below: American Herring Gull (smithsonianus) 62H 3rd cycle (3CY), November 18 2017, Stratford, CT. Picture: Donna Caporaso. 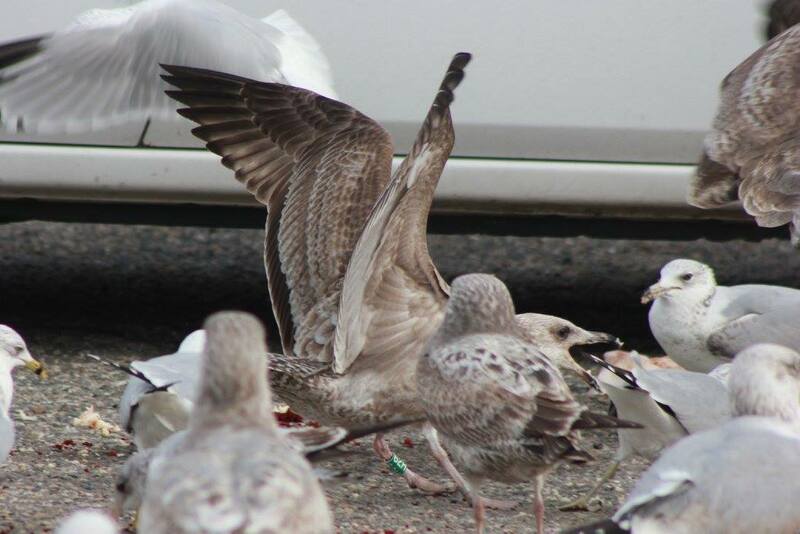 below: American Herring Gull (smithsonianus) 62H 3rd cycle (3CY), November 01 2017, Stratford, CT. Picture: Donna Caporaso. 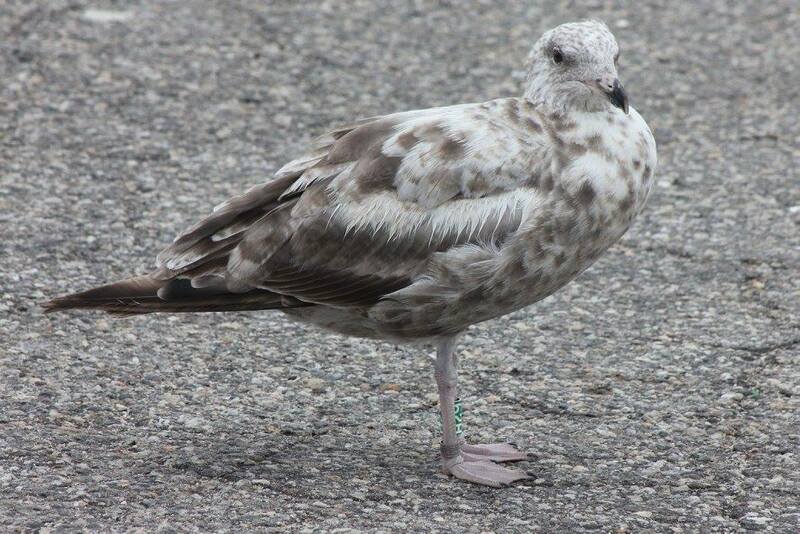 below: American Herring Gull (smithsonianus) 62H 3rd cycle (4CY), March 21 2018, Stratford, CT. Picture: Donna Caporaso. 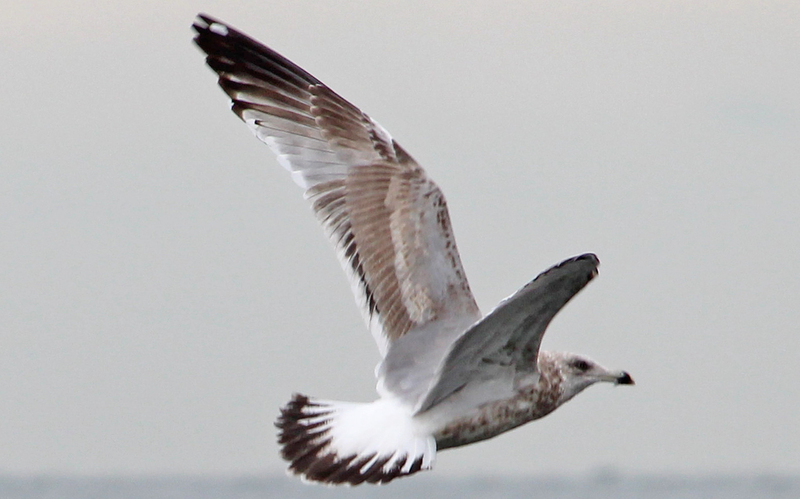 Becoming cleaner white on the breast.